Digital tools are highly productive in several vaccine-related areas. In 2017, a record 123 million children were immunized globally. Immunization is one of the most cost-effective public health interventions, averting an estimated 2-3 million deaths every year. Effective immunization programs have led to a world closer to eradicating polio than ever, while measles vaccination has resulted in an 84% drop in deaths during 2000-2016. Last year, global coverage rates for the third dose of the diphtheria, tetanus, and pertussis vaccine (DTP3) reached 85%. Despite these achievements, progress on immunization has stalled in the current decade. As of August 2018, 71 countries have yet to achieve the Global Vaccine Action Plan target of 90% or greater coverage of DTP3. In 2017, 19.9 million children under 1 did not receive the full three recommended doses of DTP3, and 20.8 million children were denied a single dose of measles vaccine. Significant efforts and resources are dedicated to supporting, maintaining, and improving immunization strategies to achieve the goals set by national and international health agencies. One of these is to achieve and maintain appropriate vaccine coverage to successfully control and eliminate vaccine-preventable infectious diseases. However, maintaining a high-performance immunization program is one of the most challenging public health objectives. A number of issues have become real threats for maintaining coverage, running effective surveillance, and allowing immunization programs to react in a timely manner to new problems. These include logistics management, underreporting and under-recognition of adverse effects following immunization, reduction of public confidence in vaccinations, and lack of effective communication strategy for vaccine promotion. One way forward is to adopt rapidly developing digital health tools that offer solutions to improve service delivery. Digitization can help boost providers’ capability to make immunization health value chains more efficient and resilient. While efficiency improvements arising from streamlined resource flows result in additional funds for possible investments to improve service delivery, resilience needs redundancy for enhanced capacity and diversity to respond effectively to risks such a stock-outs for both supplier and user. Immunization registries, dose tracking, and decision support systems. Surveillance of adverse events following immunization. Delivery of information on vaccines to the public. For improved decision support systems, leading to effective and efficient service deliver, GIS is a powerful tool to identify gaps and inequities in access to immunization services, and to support better decision making around targeting immunization resources. 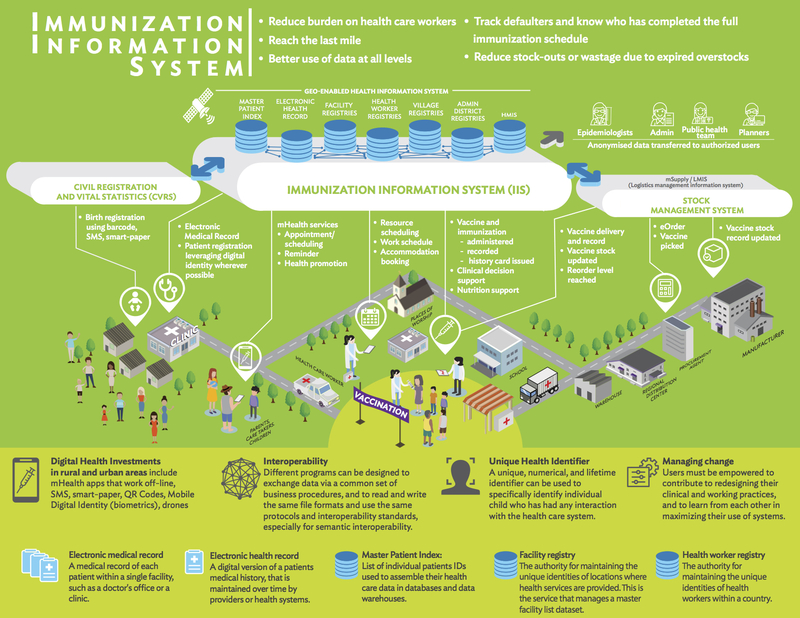 It helps integrate, visualize and analyze data on immunization resources, population distribution and the connecting geographic environment (e.g. transport network, geographic barriers), as well as model accessibility to health services. In a resource constraint settings, better integration of immunization information system and CRVS (Civil Registration and Vital Statistics) data architecture has the potential to provide transformative improvements in both systems. Among these are streamlining and extending registration coverage, integrating data from multiple systems, and securely storing data at scale – all in a cost-effective way. For example, health workers, by virtue of their extended reach, can notify civil registrars of births/deaths. In turn, health programs benefit from fully functioning CRVS data because it makes real-time data available to expand immunization coverage. A digital architecture is essential to attain interoperability between health programs, CRVS, and related systems such as unique health identifiers. Interoperability requires developing protocols to share information and data. This covers master patient indexes, electronic health records and registries, health management information systems, health IDs, and population censuses, to name a few. To achieve interoperability, it is imperative to work with communities to address issues of confidentiality, privacy, and data security within a sound legal and governance framework. Joint capacities and human resources need to be developed to implement the innovations. For instance, training materials can be adopted to diverse settings alongside institutional mechanisms for capacity development, with a particular focus on immunization and CRVS interoperability. Social workers, case managers, school employees, and community health workers must be trained on notifications of births/deaths to ensure these are officially registered according to international standards. Finally, a logistics management information system (LMIS) provides data on vaccine supply and demand, which can be used to reach more children with greater efficiency. As vaccines become more expensive and demand greater storage capacity at every level of the cold chain, countries must keep lower stock levels, reduce wastage, accurately forecast vaccine requirements, and prevent equipment failure. This requires a consistently high standard of supply chain management, which can only be achieved if all the links comply with current standards for storage and distribution. Digitization can improve LMIS via standardized data collection, quick data transmission throughout the system, error reduction, and automated reports that elucidate the best course of action. Strong vaccine supply chains ensure that children have access to the right vaccines, at the right time, in the right place. Infographic source: ADB (Susann Roth, Sonalini Khetrapal, Lori Thorell, Tom Jones, Peter Dury, Keisuke Taketani).